1. Jo, your ceramics have gone down a treat with our customers! What do you think it is that attracts people to the brilliant yet unusual nature of your ceramics? Their personalities! Engaging striking faces which are a little bit unusual and a tad unnerving! 2. Your art has featured in interior magazines such as Home & Gardens, World of Interiors and Elle Decoration, do you have a strong interest in interior design? Always. I’ve forever had a strong sense of aesthetics and the placing of objects is very important to me, whether that be in my personal styling, my artwork or in my home. My home is a place for me to express myself and to surround myself with eclectic objects that make me laugh, smile or remind me of precious memories. I am drawn to the interesting and the unusual. 3. How would you describe your home to someone who hadn't seen it before? Oooh there’s a question… some say it’s inspirational - others call it bonkers! I would agree with both! There’s a lot of black and white with bold splashes of citric colour. I love collecting the quirky and surrounding myself with things that have a history. It’s a fun cosy place full of surprises! 4. Where do you find yourself looking to most for inspiration? I find inspiration everywhere… childhood toys, artists such as Tony Oursler and Christian Boltanski, and the wonderful things I come across on my travels to places such as Japan and India. 5. You are well known for your amazing and unique ceramics, but you also paint, draw and photograph. Is this variety important to you? Yes. I would hate to be restricted to one ‘box’. All the different media feed each other and are all part of my creative process. Sometimes ideas just become whole as drawings, paintings or photographs. Other times the combination of media overlap and present new ideas to be realised in ceramics. 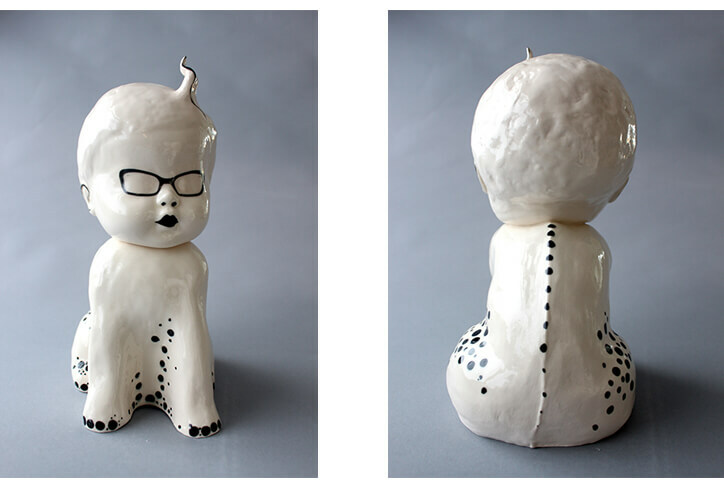 Some of my favourite photographs are of my ceramic characters… the creative process continually loops round and makes you see things in new and interesting ways, presenting new ideas, pushing you forward to your next creative outcome. It never stops! 6. 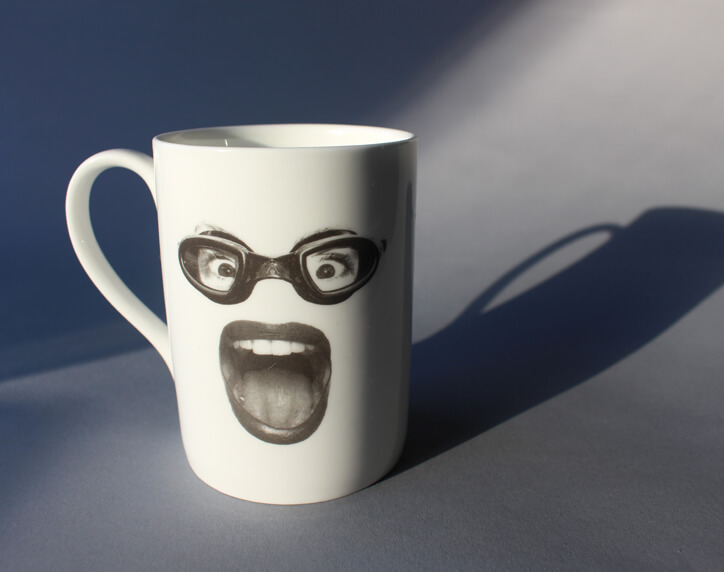 Can you talk us through your inspiration behind using faces in your ceramics? I have always loved photography and enjoy the intimate rapport that evolves when capturing an image of someone. 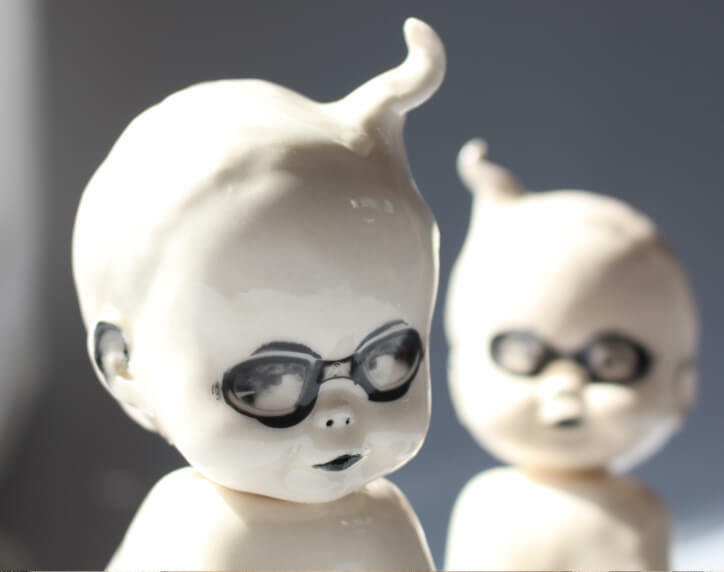 I love animating the inanimate so combining my ceramics with photography is the perfect match. I fiddle with my monochrome imagery in Photoshop, cropping features which are then made into ceramic transfers. Reminiscent of my happy days with Mr Potato Head, I then bring my characters to life by deciding who is going to get which eyes and what mouth - it always makes me laugh! I love being surrounded by people and I guess with my work you are never truly alone! 7. We are huge fans of the BabyDogs. How did you begin to create such imaginative pieces? From a collection of experiences and ideas of nurture, control and love, thoughts of Staffordshire Dogs, mantlepieces and 'family'... childhood memories of Mr Potato Head and nodding dogs and from playing around with toys in Boo!Studio. BabyDogs are made from two plaster moulds, the head (cast from my childhood dolls) and the body (cast from a hand-modelled body) allow me to place each head at a different angle, I then add an individual quiff and finally, decide which eyes they are going to get! It never fails to amuse me! 8. Out of all the busts, mugs, teapots and ornaments, do you have one favourite item that you can't part with? 9. If you weren't an artist and ceramicist where do you think you would be right now? 10. What top piece of advice can you give to artists who are just starting out in their careers? My biggest guilty pleasure is: Round things - I recently acquired some exceedingly large fluffy pompoms which have taken over my front room! My personal motto is: Seize the day and smile! My favourite film is: Breakfast at Tiffany’s - A fabulous film… quirky glamorous woman who owns a cut-away bath for a settee and dances wildly in Jazz Clubs – what’s not to love! In 5 years I’d like to: Have expanded my online presence with a new range of creatures as well as developed my 2D side. Learn to ride a motorbike and be able to juggle that fourth satsuma. 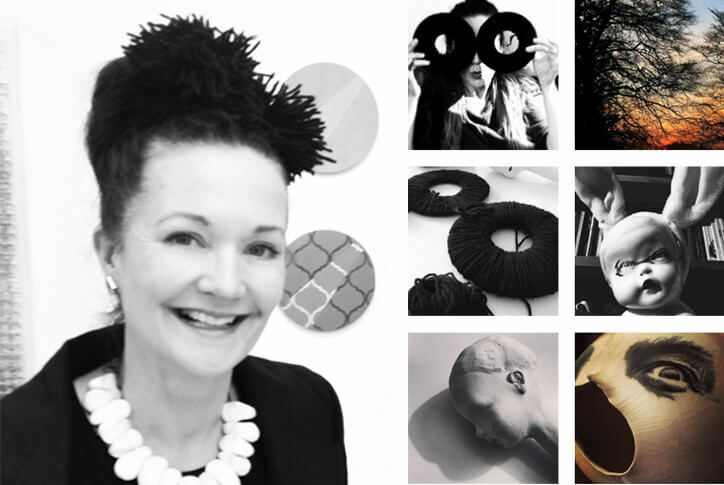 Follow Jo Lee on Twitter and Facebook for regular updates on her projects, and take a look at her website for info on workshops and teaching!